Take paper liners and line the muffin tins. Whisk the cornmeal, whole-wheat flour, baking powder, white flour and sugar in a bowl. Beat eggs with oil and milk together in a large bowl. 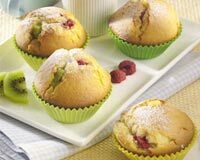 Mix dry ingredients into kiwi fruit mixture. Stir the mixture by hand until combined. Transfer the mixture into muffin tins with a spoon. Bake for about 20 minutes until well done.